...that Io is held as a sacred ground for Warlocks? The Destiny Strategy Guide is the official strategy game guide for Destiny. It was released alongside the game on September 9, 2014. It is readily available in two forms: a standard edition and a collector's edition. NOTE: The contents of the book may vary according to the type of edition. Full coverage for each and every Story and Strike Mission. The Field Manual for tips and tricks for Guardians, subclasses, vehicles and weapons. The Armory provides full knowledge of weapons and mods. Coverage for the Multiplayer Crucible component. A Codex of enemies encountered throughout the game. The book has a constant spelling error as the word "weak" is misspelled as "wzeak". Subsequent patches and expansions to Destiny have made much of the book's information obsolete. Destiny Standard Edition Strategy Guide. 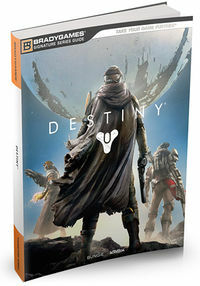 Destiny Limited Edition Strategy Guide with book jacket. The various Limited Editions of Guardian classes underneath the book jacket.